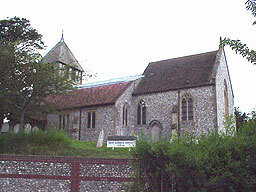 The church, a typical Hampshire structure of flint and stone, is very prominent on raised ground in the centre of the village. Pagan inhabitants may have used the site for worship before the Saxons constructed a simple wooden building, which began the tradition of Christian worship in that place. Its dedication to St Stephen is not common in the British Isles. The present church is essentially the result of the Victorian renovation and expansion in the 1880s, when William Butterfield, architect of the Royal Hampshire County Hospital in Winchester, was employed by the Rev. E.D. 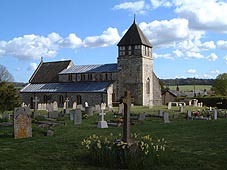 Heathcote, then fairly recently arrived as vicar, to remedy the ruinous state of the old building. The tower was strengthened and topped by a wooden belfry and spire, now covered with cedar shingles. 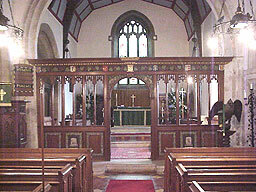 The chancel was extended and a north aisle built to include space for the organ and a vestry. The old wooden gallery was taken down and part of it used as a screen between the organ space and the chancel. During this work several intriguing and interesting discoveries were made. The bones of a horse, which might have been buried alive, were unearthed at the east end in what may well have been early rites connected with churchyards. A chalk coffin containing the burial wrappings of a medieval priest, a pewter chalice and paten were discovered in the region of the pulpit. The coffin can be seen outside the church by a blocked up entrance to the chancel. The pewter ware is in the treasury of Winchester Cathedral. The medieval church had been brightly painted and a fresco was revealed behind the altar showing St Stephen. This could not be preserved but there is an extant contemporary watercolour of it and the stone canopy over the original was repositioned above the south door. Notes: The Church can comfortably seat 115 congregation, mainly in pews; with additional chairs, a maximum of 161 guests could be seated in addition to the Bride, Groom and Bridesmaids. Outside the church, the churchyard contains some interesting nineteenth century tombs on the bank at the west end and also an eighteenth century chest tomb to John Locke to the north-east of the chancel. An ancient mass dial can be seen on the south wall of the chancel by a blocked up doorway that once gave the priest direct entry into the chancel. The churchyard is also of interest as a site of ancient meadow and produces a wealth of flowers, encouraging wild life, and a range of mosses and lichens. There are several attractive memorial windows, including two in the south aisle. One commemorates Major-General Sir Herbert Stewart, son of the vicar and a distinguished soldier, who died in the Sudan in 1885 and the other, based on a Burne-Jones design, was commissioned by Samuel Bostock of Lainston House following the death of his infant son in 1893. The space over the panelling separating the nave from the bell tower has been filled with a magnificent modern engraved plate glass memorial to Brian Sutton Downward of Deane House, who died in 1980. On the wall of the south aisle is a memorial to Helen, who was born in Sparsholt and sent by the vicar to train as a nurse in London where she met and married Sir George Buxton Browne, a highly respected surgeon. The earliest memorial in the church is on the north wall of the chancel and records the Rev. Edward Stewart, born in1808 and vicar from 1842-1875. The 1887 Walker organ was moved to the northwest end of the church in 1957 and a Lady Chapel established in its place. In 2007 the organ was returned to its original position, making it more user-friendy for the choir and congregation. This has opened up the west end of the north aisle and created opportunities for further development of the church space in response to the changing needs of the twenty-first century. Following a recent restoration, our acclaimed example of a traditional pipe organ leads the music; a sound system with microphones and inductive hearing loop is installed. The church has an enthusiastic band of ringers and a fine ring of six bells, whose history dates from 1742 when three bells were hung in an oak frame of typically vernacular construction. In 1829 an fourth bell was added and the frame extended. In the twentieth century, as part of the coronation celebrations for Edward VII, a fifth bell was added. Ninety years later, in 1995, the old wooden frame was replaced by a metal one and a sixth bell added creating a distinctive and improved ring.